Independent talk radio broadcasters encounter a void in the market between expensive bespoke software and free software catering to conference calling. Many of the broadcasters are having to hack existing tools in order to bring callers on air and manage their media. ZenoLive fills in this gap. 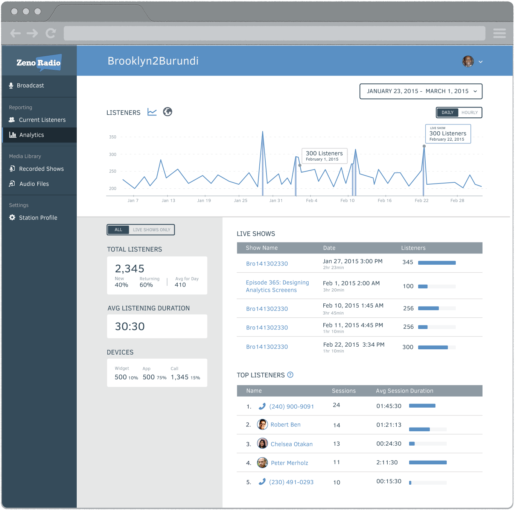 The dashboard was a new product for ZenoRadio, a company that was already supporting broadcasters to get their programming out to more listeners through dial-in distribution. Through studio visits and contextual interviews, I identified key areas where the existing products were falling short and set the direction for the product. I was the contracted lead designer on the project that was done in conjunction with the Android app. I worked closely with the technical and marketing teams to provide wireframes, UI mocks, interactive prototypes and UI patterns. I performed field studies and evaluative testing with users. I also collaborated with off-site developers to ensure that the shipped product matched user needs. 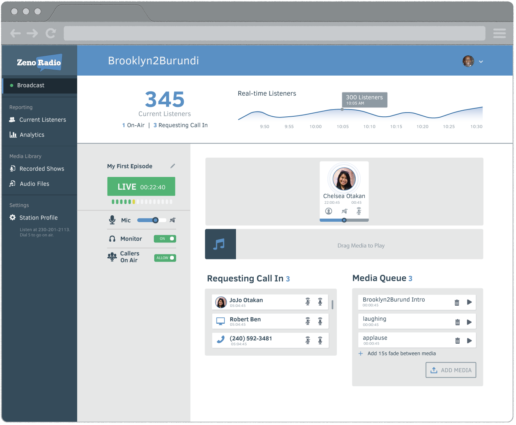 Many independent broadcasters used conference calling software to manage callers, but that posed challenges because it did not integrate with their software for publishing and managing media. This resulted in application switch, which was a lot for individual broadcasters to manage while also trying to conduct a radio show. The ZenoLive platform brings all these elements into one interface—allowing broadcasters to easily see who is in queue to go on air. 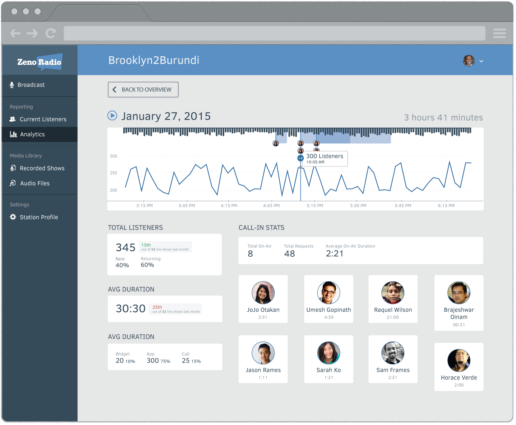 Because callers were coming in on different platforms it was difficult to get integrated information on them. 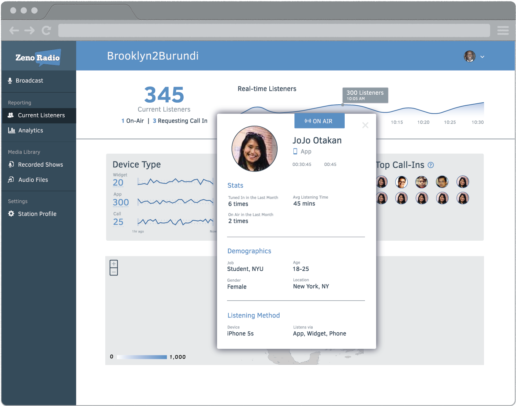 ZenoLive is able to aggregate information on repeat callers to make screening easier and their listener patterns clearer. Independent broadcasters are also producers and station managers. They need to be able to review their shows and understand the stats and trends. 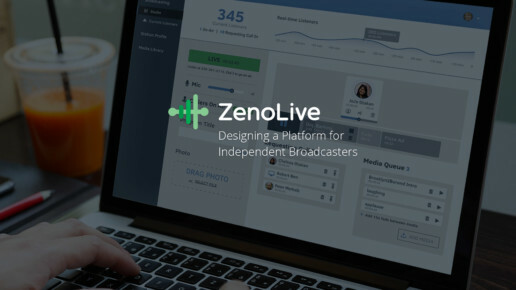 ZenoLive helps broadcasters directly match listener stats to previous programs’ content. To begin the project, I wanted to understand the existing field and establish requirements. To this end, I spoke with stakeholders across the company, including the marketing team, who had been gathering customer feedback on the existing product. I also did several studio visits with independent broadcasters in the New York City area to watch as they produced their radio shows. From the research, key gaps in the existing marketplace surfaced, and I put together a list of features. From these, I built prototypes in InVision we could use to test with internal stakeholders, local broadcasters, and paid participants. We brought in our existing customers to test the product with their own radio shows as well used a remote ‘user’ testing software to test the prototypes with podcasters and radio hosts who were unfamiliar with the product. From these testing activities, the prototypes were refined, but features for a second iteration of the product were also loosely defined to be researched further. 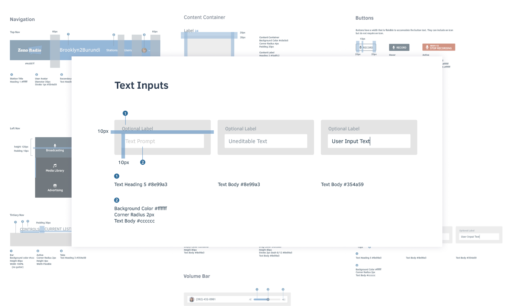 Although I worked closely with the developer throughout the research and testing process, once the first iteration of the product was defined, in order to facilitate front-end development, I created style specs. These were modular and could carry out through iterations of the product (with revisions).